For the Shizuka Kudo song, see Blue Velvet (Shizuka Kudo song). (1951) "Here in My Heart"
"Four Twenty A.M. (with The Girlfriends)"
"The Morningside of the Mountain"
"Blue Velvet" is a popular song written and composed in 1950 by Bernie Wayne and Lee Morris. A top 20 hit for Tony Bennett in its original 1951 version, the song has since been re-recorded many times, with a 1963 version by Bobby Vinton reaching No. 1. Songwriter Bernie Wayne was inspired to begin writing "Blue Velvet" on a 1951 visit to Richmond, Virginia where he stayed at the Jefferson Hotel: at a party at the hotel Wayne continually caught sight of a female guest dressed in blue velvet with whom he would have a holiday romance. The song's co-writer Bernie Wayne had pitched "Blue Velvet" to Columbia Records head A&R man Mitch Miller, who as soon as he'd heard the song's opening measure: "She wore blue velvet", had suggested giving the song to Tony Bennett. (Wayne's response: "Don't you want to hear the rest of the song? ", caused Miller to opine: "Quit while you're ahead!") Recorded in a July 17 1951 session with the Percy Faith orchestra and released September 21 1951, Bennett's version peaked at No. 16 on the Billboard chart of "Records Most Played by Disc Jockeys," while reaching No. 18 on Billboard's chart of "Best Selling Pop Singles," and No. 18 on Billboard's chart of "Most Played Juke Box Records." Bennett's version of "Blue Velvet" made its album debut on a 1959 compilation LP that was also titled Blue Velvet. The single's B-side "Solitaire" was also a Top 20 hit. "Blue Velvet" was expediently covered by Arthur Prysock - whose version although recorded a week after Bennett's evidently was the first version released, in August 1951 - , Bill Farrell, and Norman Kaye (a solo act who was also a member of the Mary Kaye Trio): the Cash Box Top 50 singles chart ranked Bennett's version and the three covers in tandem, with a peak position of No. 12 attained on the chart dated 1 December 1 1951. Cash Box also ranked Bennett's version as high as No. 11 on its chart of "The Nation's Top 10 Juke Box Tunes"." New York Times music journalist Stephen Holden would vaunt "Blue Velvet" as one of the four tracks which defined the first phase of Bennett's recording career: according to Holden "Blue Velvet" along with "Because of Your" (1951), "Cold, Cold Heart" (1951), and "Stranger in Paradise" (1953), "stand as the gorgeous final flowering of the high-romantic style invented in the 40's by Sinatra [with] arranger Axel Stordahl. Pure and throbbing, ...Bennett's voice adds a semi-operatic heft to Sinatra's more intimate crooning style. Male pop singing since [the mid-50's] has never been [so] unabashedly sweet." In 1957 Bennett would begin a longstanding working relationship with jazz pianist Ralph Sharon who Bennett would recall advised him: "If you keep singing...sweet saccharine songs like 'Blue Velvet' sooner or later...you're going to stop selling [records]" and with his 1957 album The Beat of My Heart - produced and conducted by Sharon - Bennett had launched a new musical persona as an intensely intimate song stylist. "If You Love Me (Why Don't You Tell Me So)"
In 1955, the Clovers released a version of the song through Atlantic Records as a single. The song was initially recorded, produced, and released when the R&B group was still composed of John "Buddy" Bailey (lead singer), Billy Mitchell, Matthew McQuater, Harold Lucas, Harold Winley, and Bill Harris. Various members of the group left, died, or were replaced, although the group as a whole still performed the song regardless of whom its members were. The single reached No. 14 on Billboard's Rhythm & Blues Records chart of "Best Sellers in Stores." In 1956, the Clovers released the song on their eponymous album. The first version of "Blue Velvet" to appear on the Billboard Hot 100 during the rock 'n' roll era was recorded and released by the Statues, a Nashville-based doo-wop trio consisting of Buzz Cason, Hugh Jarrett, and Richard Williams. In 1959 Cason and Williams, members of local rockabilly band the Casuals, had been invited by Jarrett, a former member of the Jordanaires and later a disc jockey at WLAC, to join him - along with veteran background songstress and composer Marijohn Wilkin - to form a vocal chorale who would back artists recording in Nashville; the three male members of the chorale were signed to Liberty Records by label founder Al Bennett, who had Snuff Garrett - in his apparent debut as a producer - record the trio in three sessions at the Owen Bradley Studio at the end of November or the beginning of December 1959. Two sides from the Garrett sessions had a May 1960 single release credited to the Statues (the group name was a reference to the Statue of Liberty, as the group was signed to Liberty Records): the intended A-side was the Marijohn Wilkin original co-write (with Polly Harrison) "Keep the Hall Light Burning" but it was the flip: a remake of "Blue Velvet," which would not only become a Top Ten hit in Nashville but also rank on regional hit parades across the US rising as high as No. 8 on the September 30, 1960 Top 50 survey for preeminent Los Angeles Top 40 station KRLA. However, the Statues's version of "Blue Velvet" would only accrue enough focused national interest to rank on the Hot 100 for a period of three weeks in August 1960, with a peak of No. 84, while reaching No. 80 on the Cash Box Top 100. "Is There a Place (Where I Can Go)"
The most successful recording of "Blue Velvet" was released by Bobby Vinton in 1963. Vinton's version reached No. 1 on the Billboard Hot 100 on 21 September 1963 and remained at No. 1 for the subsequent two weeks. "Blue Velvet" also afforded Vinton a No. 1 hit on the U.S. Middle-Road Singles chart, where its No. 1 tenure was eight weeks. Vinton's No. 3 hit in the summer of 1963, with "Blue on Blue," prompted the recording of the Blue on Blue album comprising songs featuring the word "blue" in the title. Although songwriter Bernie Wayne would recall being told by Vinton that the singer had wanted to record the song since hearing the Tony Bennett version in 1951 it was reportedly Vinton's friend, music publisher Al Gallico, who suggested "Blue Velvet" as a Blue on Blue album track and sent his secretary with a dollar to a music store to purchase the song's sheet music; an hour later, Vinton had recorded "Blue Velvet" in two takes. Vinton did not expect the song to be a hit, and believed that his remake of "Am I Blue?" had more sales potential. Vinton's version was ranked No. 5 on Billboard's end of year ranking "Top Records of 1963", No. 4 on Cash Box's "Top 100 Chart Hits of 1963", and No. 8 on Cash Box's "Top 100 Chart Hits of 1964". Vinton's recording failed to make the British charts when originally released, but the track's being heard in a televised ad campaign for Nivea cold cream effected a 1990 UK re-release with "Blue Velvet" (with "Blue on Blue" as B-side) reaching No. 2 on the UK Singles Chart. American singer and songwriter Lana Del Rey released a cover of the song "Blue Velvet" in 2012. It was taken from reissue of her debut studio album Born to Die – The Paradise Edition and her third EP, Paradise. It was released as a single on September 20, 2012, through Interscope Records, and used in an advertising campaign for the clothing retailer H&M. Del Rey had recorded a cover of "Blue Velvet" for her 2012 H&M Autumn campaign. On September 20, the song was released as a single. Del Rey was selected for the H&M ad campaign after an impressionable performance at a Mulberry dinner party. Industry moguls Michelle Williams, Alexa Chung, Elizabeth Olsen, and Anna Wintour attended the party and were impressed by the performance. A public relations manager for H&M said Del Rey was chosen because they "were looking for a style icon and singer to model our fall collection and so Lana Del Rey was the perfect choice." 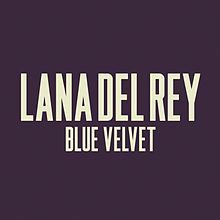 On September 19, the music video, which served as a commercial for the H&M 2012 Autumn Collection as well, for "Blue Velvet" was released through H&M. In the video, Del Rey is singing the song in a low-lit room before an audience of pallid people, playing an Americana lounge singer dressed in a pink mohair sweater, She is then hypnotized. Three women dressed identically to Del Rey sit on a couch and watch her coldly. At the end, a little man walks into the room, pulls out the plug for Del Rey's microphone, silencing her. Compared to the David Lynch film of the same name, it was directed by Johan Renck. and composed in post-World War II Americana fashion and the notion of external beauty cloaking inner vulnerability. A behind the scenes video was filmed and posted to H&M's official YouTube channel. Credits adapted from the liner notes of Paradise. The Paragons released a version of the song as a single in 1960. Their version reached No. 103 on Billboard's "Bubbling Under the Hot 100". It spent three weeks on the chart in the autumn of 1960, sharing the "Bubbling Under" chart for two weeks with the version by the Statues, which had just dropped off the Hot 100 (see Section 4 above). Lawrence Welk and His Orchestra released a version in 1963, as a single and on the album Wonderful! Wonderful! It reached No. 103 on Billboard's Bubbling Under the Hot 100. A different, fully instrumental recording was featured on Welk's 1965 album Apples & Bananas. The 2016 album Upward Spiral by the Branford Marsalis Quartet with vocalist Kurt Elling features a remake of "Blue Velvet". Bobby Vinton's "Blue Velvet" is one of the thirteen songs featured in Kenneth Anger's groundbreaking experimental film Scorpio Rising (1963). Tony Bennett's version of the song is featured in The Last Picture Show and Raging Bull. Bobby Vinton's version is featured several times in David Lynch's 1986 film Blue Velvet. The film drew partial inspiration from the song's lyrics, where Isabella Rossellini, who plays a singer in the film, also sings the song in-character. Lynch selected the song, because it conceptually matched the mood of the film. Specifically, in an interview he gave to the Village Voice, Lynch said of the song: "The mood that came with that song a mood, a time, and things that were of that time." Songwriter Bernie Wayne would state that at the film's premiere he was told by Lynch that when he was a high school student in 1963 Vinton's "Blue Velvet" had been his favorite song. The film itself heavily incorporates portions of the song. Bobby Vinton's version is featured once, in the fourteenth episode of Kamen Rider Kuuga, as the Gurongi Me-Gyarido-Gi backs up a truck. ^ Herbert, Paul N (2012). The Jefferson Hotel: the history of a Richmond landmark (1st US ed.). Charleston, South Carolina: The History Press. p. 126. ISBN 978-1-60949-687-6. ^ Bennett, Tony (1998). The Good Life: the autobiography of Tony Bennett. New York, New York: Simon & Schuster. ISBN 978-1-4165-7366-1. ^ "Records Most Played by Disc Jockeys," Billboard, November 3, 1951. p. 34. Accessed October 22, 2015. ^ "Best Selling Pop Singles," Billboard, November 24, 1951. p. 34. Accessed October 22, 2015. ^ "Most Played Juke Box Records," Billboard, November 24, 1951. p. 42. Accessed October 22, 2015. ^ "Reviews of This Week's LP's," Billboard, June 8, 1959. p. 34. Retrieved April 25, 2018. ^ The Nation's Top 50 Best Selling Records", Cash Box, December 1, 1951. p. 17. Retrieved April 25, 2018. ^ "The Nation's Top 10 Juke Box Tunes", Cash Box, December 1, 1951. p. 4. Retrieved April 25, 2018. ^ "At Carnegie Hall – Tony Bennett". AllMusic. Retrieved April 25, 2018. ^ Tony Bennett - The Good Life, norwegiancharts.com. Retrieved April 25, 2018. ^ "Duets II – Tony Bennett". AllMusic. Retrieved April 25, 2018. ^ Lipshutz, Jason. "Tony Bennett To Release Latin Music 'Duets' Album in October", Billboard.com, August 2, 2012. Retrieved April 25, 2018. ^ "Review Spotlight on...", Billboard, February 5, 1955. p. 46. Retrieved April 25, 2018. ^ "Record of the Week - "Blue Velvet" by The Clovers". The Vocal Group Harmony. Archived from the original on March 5, 2016. Retrieved April 25, 2018. ^ "Best Sellers in Stores," Billboard, April 9, 1955. p. 44. Accessed October 22, 2015. ^ "The Clovers – The Clovers". AllMusic. Retrieved April 25, 2018. ^ a b "The Statues Score with 'Blue Velvet'", Billboard, August 29, 1960. p. 22. Retrieved April 25, 2018. ^ Cason, Buzz (2004). Living the Rock 'n Roll Dream: The Adventures of Buzz Cason, Hal Leonard Corporation. p. 160. Retrieved April 25, 2018. ^ "Music as Written", Billboard, December 7, 1959. p. 35. Retrieved April 24, 2018. ^ Top Fifty Survey for Week of September 23 to 30, 1960, KRLA. Retrieved April 25, 2018. ^ Hot 100 - The Statues Blue Velvet Chart History, Billboard.com. Retrieved April 24, 2018. ^ Cason, Buzz (2004). Living the Rock 'n Roll Dream: the adventures of Buzz Cason. Milwaukee WI: Hal Leonard Corp. pp. 38–39. ISBN 978-0634066726. ^ "Cash Box Top 100 Singles – Week ending September 10, 1960". Cash Box. Archived from the original on October 6, 2012. Retrieved April 24, 2018. ^ a b Hot 100 - Bobby Vinton Blue Velvet Chart History, Billboard.com. Retrieved April 24, 2018. ^ Whitburn, Joel (1987). The Billboard Book of Top 40 Hits, Billboard Publications, Inc. p. 316. ^ Adult Contemporary - Bobby Vinton Blue Velvet Chart History, Billboard.com. Retrieved April 24, 2018. ^ "Middle-Road Singles", Billboard, September 7, 1963. p. 46. Retrieved May 2, 2018. ^ Bronson, Fred (2003). The Billboard Book of Number One Hits. Billboard Books. p. 137. ^ "Top 100 Chart Hits of 1963," Cash Box, December 28, 1963. p. 18. Retrieved April 18, 2017. ^ "Top 100 Chart Hits of 1964," Cash Box, December 26, 1964. p. 12. Accessed July 28, 2016. ^ "CHUM Hit Parade - Week of September 16, 1963". CHUM. Archived from the original on November 7, 2006. Retrieved April 24, 2018. Chart No. 340. ^ "Cash Box Top 100", Cash Box, September 21, 1963. p. 4. Retrieved April 24, 2018. ^ "Ultratop.be – Bobby Vinton – Blue Velvet" (in Dutch). Ultratop 50. ^ "The Irish Charts – Search Results – Blue Velvet". Irish Singles Chart. ^ "Bobby Vinton: Artist Chart History". Official Charts Company. ^ "Billboard Hot 100 60th Anniversary Interactive Chart". Billboard. Retrieved January 28, 2019. ^ Alexander, Ella (July 17, 2012). "H&M Confirms Lana". Vogue UK. Condé Nast Publications. Retrieved September 19, 2012. ^ London, Bianca (July 17, 2012). "Lana del Rey for H&M: Singer announced as the new face of the high street brand". Daily Mail. Associated Newspapers. Retrieved September 19, 2012. ^ "Lana Del Rey: Blue Velvet". Amazon.com. September 2012. Archived from the original on May 9, 2013. Retrieved September 16, 2012. ^ Lee, Anne. "Lana Del Rey treats fashion crowd to Blue Velvet at H&M launch party". Metro. Associated Newspapers. Retrieved 5 October 2012. ^ Thornhill, Cher (19 September 2012). "Lana Del Rey 'Blue Velvet' cover featured in H&M ad now available online". Daily Mail. London: Associated Newspapers. Retrieved 5 October 2012. ^ Nissim, Mayer. "Lana Del Rey unveils full 'Blue Velvet' advert video - watch". Digital Spy. Hearst Magazines. Retrieved 5 October 2012. ^ "Lana Del Rey - Blue Velvet". H&M. YouTube. September 19, 2012. Retrieved September 20, 2012. ^ Hogan, Marc. "Watch Lana Del Rey Sing 'Blue Velvet' in Mohair for H&M". Spin. Buzz Media. Retrieved 3 October 2012. ^ a b c Nika, Colleen (September 17, 2012). "Lana Del Rey Debuts Lynchian H&M Commercial". Rolling Stone. Wenner Media LLC. Retrieved September 20, 2012. ^ a b Rubenstein, Jenna Hally. "Watch Lana Del Rey Cover 'Blue Velvet' For H&M (VIDEO)". MTV. Viacom. Retrieved 5 October 2012. ^ a b Snead, Elizabeth (September 17, 2012). "Lana Del Rey Stars in David Lynch-Inspired 'Blue Velvet' H&M Commercial (Video)". The Hollywood Reporter. Prometheus Global Media. Retrieved September 20, 2012. ^ a b Williot, Carl. "Lana Del Rey's Dreary "Blue Velvet" Cover: Hear It In Full". Idolator. Buzz Media. Retrieved 5 October 2012. ^ Cowels, Charlotte. "Lana Del Rey's H&M Commercial Includes a Little Person, Wigs, Telephones". New York. Retrieved 5 October 2012. ^ Cress, Jennifer. "Exclusive Video: Behind the Scenes of Lana Del Rey's H&M Campaign". People. Time Inc. Archived from the original on 2015-11-17. Retrieved 5 October 2012. ^ a b c Freeman, Nate. "Lana Del Rey to Channel David Lynch's "Blue Velvet" as the Face of H&M's New Global Campaign". Artinfo. Louise Blouin Media. Retrieved 5 October 2012. ^ a b "Watch Lana Del Rey cover 'Blue Velvet' for H&M commercial". NME. Time Inc. Retrieved 5 October 2012. ^ "iTunes – Music – Blue Velvet – Single by Lana Del Rey". United Kingdom: iTunes Store. Archived from the original on September 23, 2012. ^ "Austriancharts.at – Lana Del Rey – Blue Velvet" (in German). Ö3 Austria Top 40. Retrieved December 16, 2014. ^ "Lescharts.com – Lana Del Rey – Blue Velvet" (in French). Les classement single. Retrieved December 16, 2014. ^ "Offiziellecharts.de – Lana Del Rey – Blue Velvet". GfK Entertainment Charts. Retrieved October 11, 2018. ^ "Spanishcharts.com – Lana Del Rey – Blue Velvet" Canciones Top 50. Retrieved December 16, 2014. ^ "Swisscharts.com – Lana Del Rey – Blue Velvet". Swiss Singles Chart. Retrieved December 16, 2014. ^ "Official Singles Chart Top 100". Official Charts Company. Retrieved December 16, 2014. ^ "Blue Velvet: Lana Del Rey: Amazon.fr" (in French). Amazon.com. Archived from the original on February 15, 2013. ^ "Blue Velvet: Lana Del Rey: Amazon.de" (in German). Amazon.com. Archived from the original on July 14, 2014. ^ "Blue Velvet: Lana Del Rey: Amazon.co.uk". Amazon.com. Archived from the original on December 6, 2013. ^ "Blue Velvet (2012) | Lana Del Rey". United States: 7digital. Archived from the original on 2014-12-16. Retrieved December 16, 2014. ^ "Blue Velvet (2012) | Lana Del Rey". Canada: 7digital. Archived from the original on 2014-12-16. Retrieved December 16, 2014. ^ a b "Bubbling Under the Hot 100", Billboard, October 3, 1960. p. 47. Retrieved April 24, 2018. ^ "Album Reviews", Billboard, November 30, 1963. Retrieved April 24, 2018. ^ "Bubbling Under the Hot 100", Billboard vol 75 #39 (28 September 1963) p. 22. Accessed 15 October 2016. ^ "Recent Stereo Releases for Music Operators", Billboard, September 4, 1965. p. 55. Retrieved April 24, 2018. ^ "Upward Spiral – Branford Marsalis Quartet / Kurt Elling / Branford Marsalis". AllMusic. Retrieved April 27, 2018. ^ Pelly, Jenny. "Watch: Lana Del Rey Covers "Blue Velvet" in New David Lynch-Inspired H&M Commercial". Pitchfork Media. Retrieved 5 October 2012. ^ Borden, Lizzie (September 23, 1986). "The World According to Lynch". Village Voice.